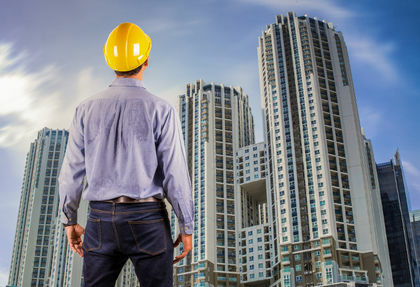 Who Inspects New Condo Construction? Home » First-Time Buyers » Who Inspects New Condo Construction? Howard Bogach is president and CEO of Tarion Warranty Corp., a private corporation established in 1976 to protect the rights of new home buyers and to regulate new home builders. His following article was published in the Toronto Sun. "For the past few years, I've watched a condo tower being built from the ground up right outside my office window.I witnessed trades people working with concrete, steel, wood and glass through cold, heat, snow and rain. I’ve watched this 42-storey condo building go all the way up — floor by floor — and now people have begun to call it home. Even though the one, two and seven year and common element warranties on this tower will not take effect until the majority of the units are occupied and the building is registered, Tarion is involved even before ground is broken. We do this by reviewing the developer’s and builder’s background for financial and technical competence. Like all other condos in Ontario, this one has been inspected by City Building Inspectors to make sure it’s up to Code. As an additional consumer protection measure, Tarion requires high-rise condominiums to engage an independent professional to provide us with ongoing reporting at certain stages of construction. This process was launched more than 25 years ago and over the years, we’ve made significant enhancements to this reporting as a result of changes in construction and industry practices. We call it Builder Bulletin 19, and it outlines what needs to be inspected, who can conduct the inspections, and how often reports must be completed.There are four milestones that we’ve identified when building a high-rise: the completion of the sub-structure (anything below ground such as the underground parking), the superstructure (above the ground), the building envelope (the barrier from the outside elements) and finally the building being water tight. External consultants such as engineers and architects are required to provide Tarion with reports at each milestone as well as 60-day reports that are used as a tracking mechanism on the progress of construction between these milestones. The requirements in Builder Bulletin 19 are in addition to the City’s regulated inspections on condominium construction. After the last building milestone is reached, Tarion receives a final document that includes all required reports along with a Field Review Declaration, which provides the consultant the opportunity to identify any building defects. This document is turned over to the condo corporation after registration of the building. It may be used to help manage the common elements warranty process. Over the years Tarion has looked at our claims data to assess the need for tighter controls on certain inspections. For example, noise levels were once a common complaint on warranty forms. Unit holders were bothered by the loud sounds of the building’s mechanical equipment, and could also hear their neighbours beside, above or below them. In 2010, Tarion strengthened the requirements of acoustic controls based on this information. A consultant must now verify and test the acoustics at a certain stage of construction to ensure the building is built according to building code standards."